Hospice du Rhône in Paso Robles! It was wonderful to have that event back after a four-year hiatus. And just as we did in the old days, a few of us arrived in Paso Robles a day early so we could do some local wine touring on the Thursday just before HdR started. Eric Anderson, Al Osterheld, and I all drove separately to Paso on Wednesday and got into town by late afternoon. Al was running a bit later than Eric and I, so we figured a convenient place to meet would be at Barrelhead Brewery in the “Tin City” complex just south of town – we could start in on some brews while waiting for Al. The timing worked out fine, and Al arrived as Eric and I were still working on our first round of Barrelhead IPAs. We all met up again for dinner at Villa Creek Restaurant. We sat in the bar area and enjoyed a couple of wines we’d brought there – the highlight was a 2001 Jaboulet Hermitage “La Chapelle.” After a short stop for coffee on Thursday morning, we headed out on the road to our first of three winery appointments that day, a few miles through the beautiful hills of Westside Paso Robles to Adelaida Cellars. Adelaida 2014 “Anna’s White,” Anna’s Estate Vineyard, Adelaida District, Paso Robles. 54% Grenache Blanc, 22% Viognier, 13% Picpoul, 11% Roussanne. Light straw color, this had citrus and green apple aromas along with lightly herbal undertones. Medium-bodied with moderate acidity and a smooth, pleasant finish. Adelaida 2015 Rosé, Adelaida District, Paso Robles. 51% Grenache, 24% Carignane, 14% Cinsaut, 5% Mourvèdre, 4% Counoise, 2% Syrah. Light salmon/pink color, featuring bright red fruits plus savory and earthy notes. Vibrant mouthfeel with a clean, refreshing finish, nice. Adelaida 2014 Pinot Noir, HMR Estate Vineyard, Adelaida District, Paso Robles. Medium-light ruby color, with pretty floral scents, upfront black cherry and darker fruit, lots of spice, and touches of earth and toasty oak. Medium weight with a lively mouthfeel and finish – the best Pinot I’ve tried from this area. Adelaida 2013 Syrah, Anna’s Estate Vineyard, Adelaida District, Paso Robles. Darker color, with aromas of ripe dark berry fruit, herbs, lots of baking spice, and touches of black pepper and vanilla/oak. Medium-full bodied with good acidity and a bright finish with moderate tannins. 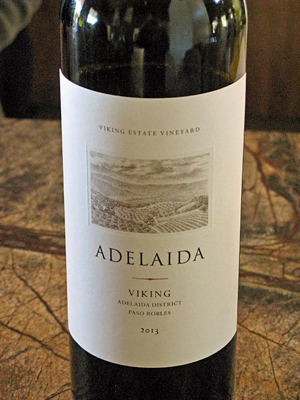 Adelaida 2013 “Viking,” Viking Estate Vineyard, Adelaida District, Paso Robles. 56% Cabernet Sauvignon, 20% Cabernet Franc, 16% Malbec, 8% Petit Verdot. Medium-dark purple, this displayed fruit-forward plum and currant along with dried herbs and a framework of sweet oak. More structured mouthfeel with a lively texture and medium-big tannins on the finish – tasty now and should be good for medium-term cellar aging. Adelaida 2013 Zinfandel, Estate, Adelaida District, Paso Robles. Medium purple color, with fresh, savory and brambly ripe plum and boysenberry aromas with notes of pepper and earth. Medium weight with bright acidity, moderate tannins, and a lingering finish, nice. Adelaida 2014 Mourvèdre, Anna’s Estate Vineyard, Adelaida District, Paso Robles (tank sample). Showing a bit reductive right out of the tank, this had floral, plum, and blueberry aromas along with earthy and herbal notes, finishing with moderate tannins – shows good potential. Adelaida 2014 Syrah, Anna’s Estate Vineyard, Adelaida District, Paso Robles (tank sample). Darker color showing a darker fruit profile and lots of spice on the nose, with a big, structured mouthfeel and grippy youthful tannins – this will need more time to show its best. 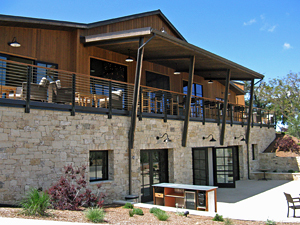 Adelaida was one of the first wineries I visited in Paso Robles, nearly 25 years ago. At that time and on a couple of subsequent visits in the next few years, I thought the wines were fair to good, but not much more than that. By the mid-2000s, word was out that a new winemaker had taken over and the wines had taken a step up in quality, so Eric arranged for a group of us to visit there in the summer of 2005 with winemaker Terry Culton. The wines were indeed noticeably better than what I’d remembered from earlier visits. We returned for another group visit in spring 2006, but for whatever reason, I hadn’t been back since then. 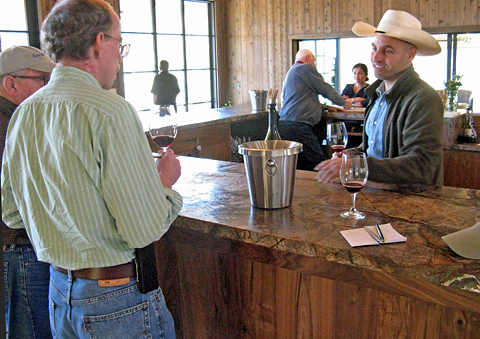 In the meantime, Terry had left and as of 2012, the new winemaker is Jeremy Weintraub. I’d met Jeremy during a visit to Gary Gibson’s Shadow Canyon Vineyard in 2008 – Jeremy was making the wines there at that time. So I thought this would be a great opportunity to reconnect with Jeremy as well as to revisit the wines of Adelaida. After a couple of emails with Jeremy, we set a time for our appointment and he wrote that we should just ask for him at the tasting room when we arrived. I was the driver for the day, and Eric and Al joined me for the drive out of Paso Robles and along Adelaida Road to the winery, where we pulled into the parking area and started walking toward the facility. The only trouble was that Adelaida has added some brand-new buildings – including a new tasting room – and we weren’t quite sure where to go. But after a couple of minutes, I spotted Jeremy outside one of the new winery buildings and he welcomed us in. Adelaida Cellars is owned by the Van Steenwyk family of Southern California, who bought property along Adelaida Road in the late 1970s. The winery was launched in 1981, with John Munch making the wines (he now has his own Le Cuvier label) and using fruit purchased from local growers. By the early 1990s, the Van Steenwyk family began planting an estate vineyard at Viking Ranch, which they had acquired earlier. In 1994, they purchased one of the most historic vineyard sites in the Paso Robles area, and indeed in the entire Central Coast. 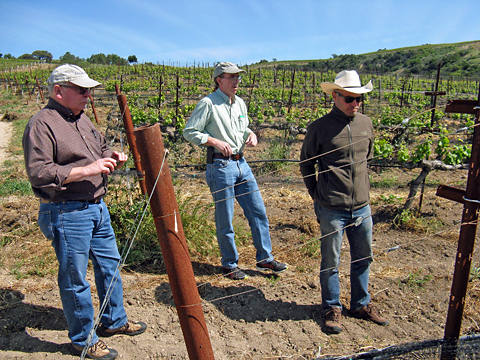 The old Hoffman Mountain Ranch vineyards were first planted by Dr. Stanley Hoffman in 1964, and include the oldest existing Pinot Noir plantings in either San Luis Obispo or Santa Barbara counties. Most of the original Pinot vines are still there, as are some rare Gamay Noir vines planted the same year. Now named the HMR Estate Vineyard, the old vines there still play a significant role in Adelaida’s wine program. 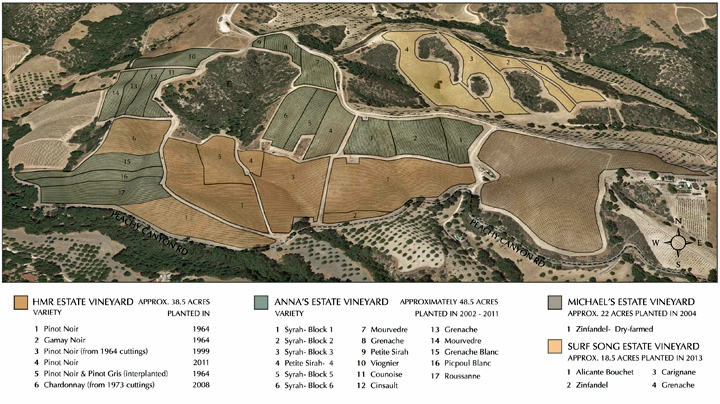 More recent estate plantings include those at Anna’s, Michael’s, Bobcat Crossing, and Upper Viking vineyards. After John Munch departed Adelaida, Terry Culton made the wines beginning in 2003 before leaving the winery in 2012. Jeremy started doing consulting on the winery’s program of Bordeaux-variety wines during the spring of that year and took over as winemaker following harvest and crush. Originally from New York, Jeremy took a summer job at a Long Island winery when he was 20, conducting tours and tastings there. Although he did not immediately go into the wine business, the lure finally got to him some years later when he left his job to do vineyard work on Long Island. He soon left New York to study at Fresno State and UC Davis, where he earned a degree in viticulture and enology. He’s worked at some noted producers in Italy and New Zealand but he’s perhaps best-known for his tenure at Seavey Vineyard in Napa Valley, where he was the winemaker for several years following his work at Shadow Canyon. 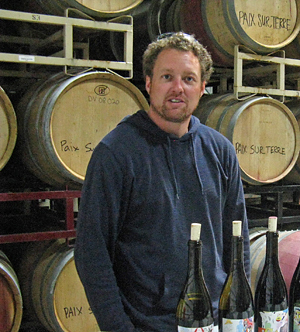 In addition to making the Adelaida wines, Jeremy has his own label called Site, with Rhône-variety wines made with fruit from some of Santa Barbara County’s top vineyards. Inside the winery, Jeremy showed us a few of their large wood tanks as well as concrete tanks with built-in glycol tubing. 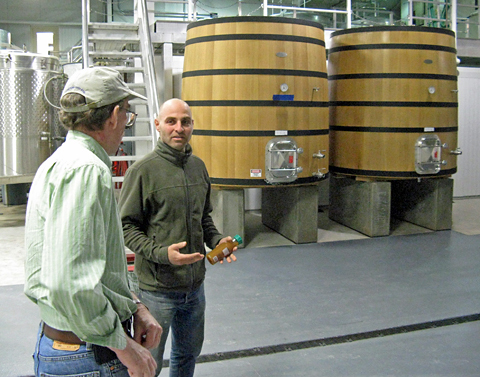 He said that they ferment Cabernet in the wood tanks and that they’re having new concrete tanks made in the same truncated conical shape as the wood ones. But Jeremy knew that we’d all seen our share of wineries before and asked whether we wanted to take a ride with him to check out Adelaida’s vineyards. Of course! We all walked outside and hopped into an SUV that could handle the steep dirt tracks that led to some of the vineyard sites. And if you’ve ever met Jeremy, you know that he quickly grabbed his trademark cowboy hat before we headed out – I think our short time with him before we visited the vineyards is the only time I’ve ever seen him without that hat! Adelaida’s vineyards are extensive and far-flung. There are about 145 acres of grapevines on the property – though that pales in comparison to the 700 acres of walnut trees there. The Bobcat Crossing Vineyard is near the winery’s Adelaida Road location but the other sites are closer to Peachy Canyon Road to the south, and the Viking and Upper Viking vineyards are on the other side of that road. As we headed south, Jeremy drove us past the Daou Vineyards facility – he told us that they had purchased the site of the old HMR winery while Adelaida owns the old vineyards. Adelaida’s various vineyards range in elevation from around 1,400 to 2,000 feet. Jeremy told us that they began an organic farming program in 2013 and that about 1/3 of the vines are currently dry-farmed – they’re working to wean the rest from irrigation in the coming years. The winery employs a full-time 10-person vineyard crew. It would be good here to provide a short summery of Adelaida’s vineyard sites. Bobcat Crossing is a smaller site with Muscat and several Portuguese varieties. HMR has the old-vine Pinot Noir and Gamay Noir, some more-recent Pinot plantings, and Chardonnay grafted with cuttings from HMR’s original 1973 planting of that variety. Anna’s, adjacent to HMR, is planted to white and red Rhône varieties. Nearby Michael’s is entirely dry-farmed Zinfandel, while an adjacent (and yet to be permanently named) site includes dry-farmed Zin, Alicante Bouschet, Carignane, and Grenache. Viking and Upper Viking are predominantly Bordeaux varieties plus a little Syrah. All of the vineyards feature different elevations, exposures, and slopes, and the different grape varieties are suited to the various sites. The Zin vines are all head-trained, as are all the vines at the site that includes the Alicante Bouschet, Carignane, and Grenache. Jeremy said that they’ll be head-training some Cabernet vines as well. We drove past the Rhône varieties at Anna’s Vineyard as we headed down the hill toward the old HMR Pinot vines. At the lowest and coolest portion of Adelaida’s vineyard sites, the original own-rooted 1964 vines – the clone is not known – are planted on the calcareous soil common to Adelaida’s vineyards. Crop yield on these old Pinot vines is around one ton per acre. The small adjacent block of Gamay Noir is a rarity, with the oldest Gamay vines on the Central Coast. The old style of wide spacing for the vine rows is very much in evidence at the HMR site. We continued east from HMR to adjacent Michael’s Vineyard, where we stopped to look at the dry-farmed head-trained Zinfandel vines, many of them planted on a very steep hill. 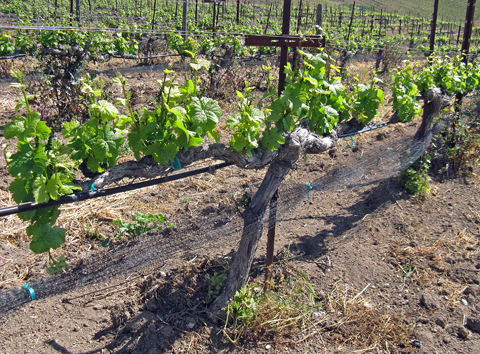 These vines were planted in 2002 with cuttings taken from two very old Zin vineyards in the area. From the base of the hill at Michael’s, we looked out toward the hills to the north at Adelaida’s other head-trained vineyard site. Getting back in the SUV, we crossed Peachy Canyon Road and headed up to Viking and Upper Viking vineyards. As we climbed higher, we had a good view of the unmistakable terraces of Glenrose Vineyard just to the east. Stopping briefly near the top of Upper Viking, we could see that the chalky soil was significantly rockier than at the lower vineyard sites. Our tour of the Adelaida estate vineyards was fantastic, but with limited time until our next appointment, we finally had to head back to the winery. Jeremy led us to the new tasting room to try some current releases. The new space is large, light, and airy, a definite step up from their old tasting room. We started out with the 2014 “Anna’s White” Rhône-style blend. 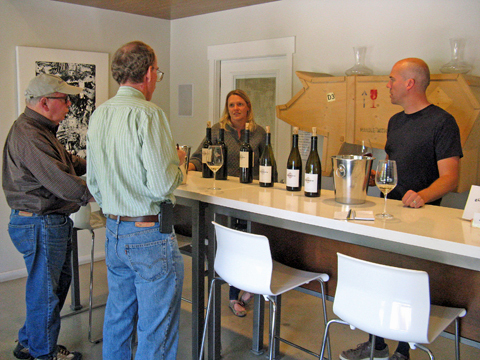 Jeremy told us that the blends that had previously been called “Version White” and “Version Red” are now labeled “Anna’s White” and “Anna’s Red” to call attention to the vineyard site as well as to downplay the notion that the wines are merely versions of something else. We next tasted the 2015 Rosé, made mainly with Rhône grape varieties and from fruit picked early specifically for this refreshing wine. Jeremy followed the Rosé with Adelaida’s 2014 Pinot Noir from the old vines of their HMR Vineyard. He said that he’s generally picked the Pinot fruit at 23-24 brix and that he uses a small percentage of whole clusters in the fermentation – about 10% in the 2014 – with the rest being whole berry. The wine is aged in about 30% new French oak, and Jeremy talked with us about his choice of coopers, as he avoids those that impart a more aggressive oak character to the wine. We also recalled that Adelaida wines had been made mostly in American oak in the 1980s and 1990s but this has not been the case for many years. Coming from a region not known for Pinot Noir or other cooler-climate varieties, this HMR Pinot was a fine effort – reminiscent in a way of some Santa Barbara bottlings – it was the best Pinot I’ve tried from the Paso Robles area. Next up was 2013 Syrah from Anna’s Vineyard, aged in about 40% new French oak, both puncheons and barriques. The 2013 “Viking” Bordeaux blend came from Upper Viking Vineyard, and the wine underwent a 30-day extended maceration to help soften the tannins. We finished our tasting of current releases with the 2013 Estate Zinfandel. This bottling is 100% varietal, though Jeremy told us that the Zin has been blended with a small percentage of Petite Sirah in some vintages. This was a bright and savory Zin, with ripe fruit that was fresh and not jammy, quite distinctive. Although we didn’t have time to taste the Gamay Noir, the wine is worth a brief mention. Adelaida had used its Gamay fruit for some blending but had also made a nouveau-style wine, using carbonic maceration. Jeremy told us that he’s not a fan of nouveau-style wines but loves Cru-level Beaujolais (Morgon, Fleurie, Moulin-à-Vent, etc. ), so starting in 2014 he’s making a more “serious” bottling of Gamay Noir inspired by that style. One thing to note about the new vintages of Adelaida wines – they’ve recently revamped their label design. The old labels featured a pair of faces on them, while the new ones are a more “classic” label design – some just have simple and elegant text while others include a drawing showing the view from one of the winery’s hilltop vineyard sites. The new top-of-the-line Signature Series wines will feature the signature of winery owner Elizabeth Van Steenwyk. The label change is another step up for Adelaida in my opinion. True, the old “faces” labels did have a story behind them, but the look always struck me as a bit unsettling while the new ones are clean and tasteful. Though we were starting to run a bit short of time, Jeremy wanted us to try a couple of tank samples of wines that would be bottled soon. We tasted a 2014 Mourvèdre that will be one of Adelaida’s Signature Series wines, and finished up with a 2014 Syrah – both obviously need some time to develop further but they were very promising, particularly the Mourvèdre. As we walked back out of the winery, we spotted Adelaida national sales manager Paul Sowerby, whom we’d met during our visits to the winery ten years earlier. Remarkably, he recognized us and he even remembered my name – I guess that sort of memory is handy in his position! Tasting some of the current Adelaida wines with Jeremy was fun, and riding along with him on the tour of the estate vineyards was a real blast. I had to check the aerial view of the Adelaida estate vineyards on their website afterwards to get a true sense of where we’d been, and we were all over the place! It’s no wonder that they’re able to grow so many grape varieties when you see how different all of the vineyard sites are. Adelaida has had a long history on the Westside of Paso Robles – I felt the wines took a step up about 10 years ago and with Jeremy taking over the winemaking duties in recent years, I feel the latest wines are taking a further step up in quality. The wines in general struck me as being on the riper side – it is Paso, after all – but well-balanced, with the alcohol kept in check by the wines’ other aspects. None of the wines we tasted were in the big, rich, extracted style favored by many Paso vintners these days – there was a welcome sense of restraint along with the ripe fruit. My favorites included the Rosé, Pinot Noir, “Viking” blend, Zinfandel, plus the Mourvèdre tank sample. Adelaida is one of those wineries that’s easy to overlook if you’re searching for the latest thing, but with their changes in both farming and winemaking (not to mention their impressive new tasting room), they’re almost like a brand-new winery. I was guilty of bypassing Adelaida for too many years, but after seeing and tasting what Jeremy has been doing there, I’ll be back again soon. Paix Sur Terre 2015 Ugni Blanc, Kiler Grove Vineyard, Willow Creek District, Paso Robles. Made entirely in stainless steel. Very light straw color, featuring lemon, fresh herbs, and a stony mineral component. Lighter-bodied with brisk acidity and a minerally note on the crisp finish, nice. Paix Sur Terre 2015 Grenache Blanc, Glenrose Vineyard, Adelaida District, Paso Robles. Made entirely in stainless steel. Very light color, this had stone fruit and pear aromas along with a chalky mineral notes. A bit more weight and texture on the palate than the previous wine, but retaining lively acidity and a clean finish, nice. Paix Sur Terre 2014 “Songs of its Own,” Glenrose Vineyard, Adelaida District, Paso Robles. 46% Grenache, 35% Mourvèdre, 17% Syrah, 3% Cinsaut, 50% whole-cluster fermented, aged in neutral oak. Medium garnet/purple, this showed bright black cherry and plum fruit along with a savory herbal element. Medium-bodied with a lively mouthfeel and a moderately tannic finish. Paix Sur Terre 2014 “The Other One,” Glenrose Vineyard, Adelaida District, Paso Robles. 100% Mourvèdre, 100% whole-cluster fermented, aged in 15% new French oak. Medium color, with loads of upfront fresh herbs on the nose, along with earth, bright plummy fruit, and undertones of wet stones and oak. Medium weight on the palate, this had good structure and fairly refined tannins – should develop nicely with more bottle age. Paix Sur Terre 2014 “Comes a Time,” Alta Colina Vineyard, Adelaida District, Paso Robles. 100% Mourvèdre, 100% destemmed, aged in neutral oak. Medium purple, this showed a much different character from the previous wine, with earth, rare meat, and touches of leather and spice in the foreground with plum and darker berry fruit in support. Bigger and more structured mouthfeel, with a grippy tannic finish, this shows lots of potential and deserves time in the cellar. Paix Sur Terre 2014 “Either Side of the Hill,” Glenrose Vineyard, Adelaida District, Paso Robles. 85% Syrah, 15% Mourvèdre, about 25% whole-cluster fermented, aged in 15% new oak. Medium-dark purple, displaying floral and spicy aromas plus black fruits, earth, and a touch of mocha. The richest mouthfeel of the four reds, with big but broad tannins on the finish. 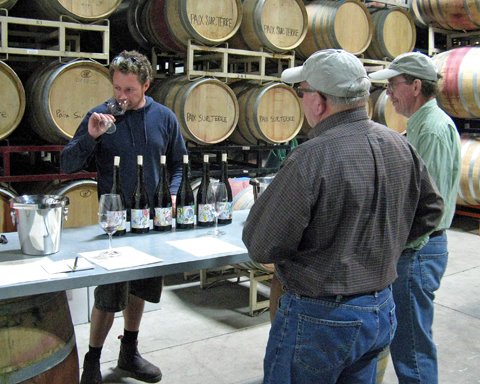 Eric and I had visited Paix Sur Terre owner/winemaker Ryan Pease in early 2015, and I felt his wines were some of the highlights of that Central Coast wine tour. When Ryan contacted me in late March to ask about trading a couple of bottles, I replied that the timing would be perfect since I’d be in Paso Robles for Hospice du Rhône in a few weeks, and it would also be a good opportunity to try his most recent releases. As we did the previous year, we met Ryan at Grey Wolf Cellars along Highway 46, a couple of miles west of 101, where Ryan makes his Paix Sur Terre wines. Ryan and his wife Nicole released the first Paix Sur Terre (pronounced “Pay Su Terr” and French for “Peace on Earth”) wines from the 2010 vintage. Ryan is originally from the San Francisco Bay Area, and he and Nicole learned about wine by trying out bottlings from Trader Joe’s to find out what they liked. As they continued trying more wines, it turned out that they both loved Mourvèdre from Bandol – especially the wines of Domaine Tempier – and this variety has become a specialty of Paix Sur Terre. Ryan earned a degree from Cal Poly in San Luis Obispo and he’s worked for Linne Calodo and Epoch – he credits Linne Calodo’s Matt Trevisan with helping him learn winemaking. As Paix Sur Terre is not yet a full-time job, Ryan also started working as assistant winemaker at both Grey Wolf and Lone Madrone in 2012 – he recently moved up to become head winemaker at Grey Wolf and he’ll no longer be working at Lone Madrone after this summer. In addition to her role in Paix Sur Terre, Nicole is the operations manager for McPrice Myers / Barrel 27. Ryan and Nicole do just about everything themselves for their label, and they’re looking to keep things that way. The annual production is around 600-800 cases, and Ryan said they plan to eventually top out at about 2,000 cases. Although the winery is small, they’ve attracted a fair amount of attention, largely due to good press from a number of sources – for example, their 2012 “Either Side of the Hill” bottling was among the San Francisco Chronicle’s Top 100 West Coast Wines. 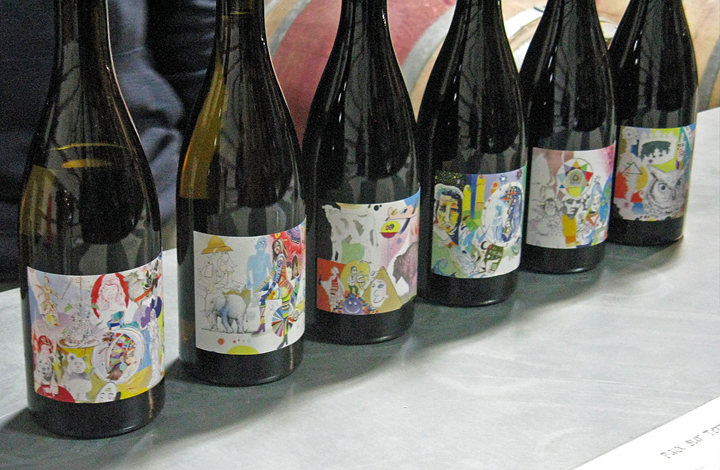 The artwork for the wines’ colorful and distinctive labels is created by Ryan’s longtime friend, artist Jon Blythe. We walked into the Grey Wolf barrel room with Ryan, where he had opened his current releases for us to taste. All the wines are sourced from Westside Paso vineyards in the new Willow Creek and Adelaida District AVAs. First up was the 2015 Ugni Blanc (known as Trebbiano in Italy). It’s a grape that doesn’t generally get much respect when made as a varietal wine and it’s used largely for blending or as a base for brandy. But as I found when I tried the Paix Sur Terre version last year, when it’s planted in the right place and farmed for quality rather than quantity, it can make a very fresh and lively wine. The fruit is from Kiler Grove Vineyard – planted at a windy, rocky limestone site in 2001, the crop yield is naturally low. Next was a new wine for Paix Sur Terre, a Grenache Blanc sourced from 18-year old vines on limestone soil from Glenrose Vineyard, a steep terraced hillside site along Peachy Canyon Road. Both whites were made entirely in stainless steel. Moving to reds, we started with “Songs of its Own,” a Grenache-based blend sourced from Glenrose Vineyard. From vines that are 18-21 years old, this was fermented with about 50% whole clusters. The current 2014 vintage features a higher percentage of Mourvèdre in the blend than the 2013 had. The first of two 100% Mourvèdre wines followed – 2014 “The Other One”. Also sourced from Glenrose, this was entirely whole-cluster fermented. All of the Paix Sur Terre reds are fermented in small lots and are aged in 85% to 100% neutral oak. We contrasted “The Other One” with our next wine, 2014 “Comes A Time”. Also 100% Mourvèdre, the fruit came from siliceous shale soil at Alta Colina Vineyard and was entirely destemmed. Bigger and more structured than the previous wine, it struck us as being more Bandol-like. Ryan said that the 2015 vintage of “Comes A Time” will be whole-cluster fermented and that is will have softer tannins due to the partial carbonic fermentation within the unbroken berries. Our final wine was the 2014 “Either Side of the Hill” blend. From 21-year old Glenrose Vineyard vines, this has a bit more Syrah than in the 2013 vintage. Ryan told us that he was not able to make this wine in the 2015 vintage due to very small crops of Syrah and Grenache that year. The weather during flowering season was largely responsible for this – it was an issue in much of California in 2015 – but Ryan noted that the Mourvèdre crop was a good one, due to the later flowering of that variety. He also mentioned that he will have one more single-vineyard Mourvèdre bottling from the 2015 vintage – the new one will be from Yankowski Weeks Vineyard just off of Peachy Canyon Road. This will be from a Spanish Monastrell clone rather than the French clones Ryan has worked with from Glenrose and Alta Colina vineyards. Although Paix Sur Terre has become especially well-known for their flagship Mourvèdre bottlings, I’ve found their white wines to be just as distinctive. Ryan has done a fine job of working with his growers to get fruit for his whites that’s relatively low brix (the two wines are just 13.2% and 13.1% alcohol) yet still has plenty of flavor. His reds are riper, up around 15%, but the balance is so good that the alcohol never stands out at all. And something that I’ve found in just about all of Ryan’s wines is fine acidity and a sense of stony minerality. They’re big yet nuanced, with more complexity than you might expect for a wine with ripe Paso Robles fruit. Of the reds, my favorites were the two Mourvèdres, each showcasing a different side of the grape. I’ve been impressed with Ryan’s Paix Sur Terre wines, and although they’re still a bit under the radar, I think they’ll gain the wider recognition that they deserve sooner rather than later. Giornata 2015 Fiano, Paso Robles. Light straw color, this had pear and stone fruit aromas with notes of fresh herbs as well as honey (a typical characteristic of the variety). Medium-light bodied with a slightly chalky texture and a clean finish. Giornata 2015 Barbera, Paso Robles. Medium purple, showing fresh black cherry, plum, and spice on the nose with earth and tomato undertones. Bright mouthfeel with lively acidity and mild tannins. Giornata 2013 Nebbiolo, Luna Matta Vineyard, Paso Robles. Medium-light garnet color, with fresh floral and red fruit aromas along with touches of earth, spice, tar, and dried herbs. Medium weight with great structure and firm, chalky tannins on the finish – needs cellaring but has lots of promise. Giornata 2013 Sangiovese, Luna Matta Vineyard, Paso Robles. Medium purple, displaying ripe cherry plus earth and spice notes. Medium-full bodied with plenty of structure and fairly big, chewy tannins. Giornata 2013 Aglianico, French Camp Vineyard, Paso Robles. Medium-dark purple, this upfront had ripe dark berry fruit with herbs, earth, and a floral note. Fairly rich mouthfeel, finishing with big but not harsh tannins. Giornata 2013 Aglianico, Luna Matta Vineyard, Paso Robles. Slightly darker purple color, with a more earthy and savory character along with black fruits, spice, and a touch of sweet oak in the background. More structured than the previous wine, with a big, chewy tannic finish – another wine in need of cellar time but with good potential. Giornata 2014 Aglianico, French Camp Vineyard, Paso Robles. Dark purple, showing more plum character along with darker fruits, plus spice, dried herbs, and a peppery note. A bit less forward and more structured than the 2013 vintage of this wine, this finished with moderate tannins – should develop and improve for at least a few years. 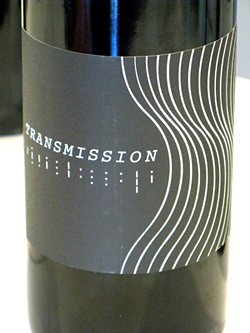 Transmission 2014 Zinfandel, Paso Robles. Medium purple color, with bright and fresh berry, herb, earth, and pepper aromas. Medium-bodied with a lively texture, good acidity, and moderate tannins – not at all a jammy fruit-bomb Zin, this shows fine restraint and balance, nice. Our final stop of the day was at Giornata Wines in Paso Robles’ Tin City complex. Although Giornata’s Brian Terrizzi was not available that day – he was busy bottling wine for his Broadside label – his wife and co-proprietor Stephy Terrizzi met us at the tasting room adjacent to their winery, and assistant winemaker Dave McDonald joined us there as well. The wines have been made at a few different locations over the years but they’ve been in their Tin City space since 2013 and seem to be settled in there for the long term. 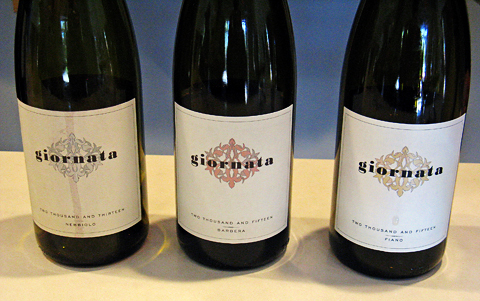 Brian and Stephy founded Giornata in 2005, making just a single barrel of Nebbiolo that year. Their first commercial releases in 2007 came from the 2006 vintage, and the label has grown slowly but surely in the years since. They’ve always been focused on wines from Italian grape varieties – the winery motto is “Inspired by Italy – Crafted in California.” Brian and Stephy met while they were studying enology at Cal State University in Fresno. Brian has worked in winemaking for a number of producers in California, notably Rosenblum, Red Car, and Sinor-Lavallee, as well as working with Paolo DeMarchi at Isole e Olena in Tuscany. He and Stephy also run the Broadside label, which specializes in more value-oriented Central Coast wines. Stephy has worked in the restaurant business – she’s earned an advanced sommelier certificate from the WSET Court of Master Sommeliers – and studied viticulture while working for vintners in Napa and Sonoma before continuing her studies at Fresno State. She’s the vineyard manager at Luna Matta Vineyard along Peachy Canyon Road (certified organic vineyard since 2010), manages vineyard operations for Broadside, and consults for other vineyard owners as well. The last time I’d visited Brian and Stephy was at their home in the eastern portion of Paso Robles’ Templeton Gap – an area where cooler marine air flows through a low spot in the coastal mountains and is funneled to the east. As we looked out from their house over the rolling hills during that visit, Brian had mentioned how much the area reminded him of parts of northern Italy. Brian and Stephy had been preparing part of their hilly property for planting their own small vineyard (about four acres) at that time, and I wanted to find out how the vines were coming along. Stephy told us that they were coming online and the fruit from their vineyard will be going into some upcoming Giornata wines soon. Varieties at their estate vineyard include Friulano, Trebbiano, Ribolla Gialla, Sangiovese, and Nebbiolo. The Ribolla came from cuttings given to Brian and Stephy by Napa’s George Vare shortly before he passed away in 2013 – he had in turn gotten his cuttings for that variety from noted vintner Josko Gravner in Friuli. We started out our Giornata tasting with a recently-released white wine, the 2015 Fiano. The fruit was sourced from a vineyard near San Marcos Road in the northern part of the overall Paso Robles appellation. The vines are about 10-15 years old and they’re grown on silty clay and calcareous soil, while the wine was made entirely in stainless steel. Moving to reds, we tried the 2015 Barbera that aims for a fresh, early-drinking style. The Barbera fruit came from two hilly vineyards in the Creston and Shandon areas, and the wine was made mostly in open-top wood fermenters, aged in neutral oak (partly in a large Italian oval cask) plus a little stainless steel, and bottled in February. Giornata’s flagship wine, their Nebbiolo, was up next. The 2013 vintage was bottled last summer and was just released. The fruit undergoes a 3-4 week extended maceration before pressing to help tame the variety’s ample tannins, and the wine is barrel-aged for about 24 months. This showed Nebbiolo’s classic rose and tar aromatics nicely. We continued with 2013 Sangiovese from Luna Matta Vineyard, aged in about 25% new French oak and released last fall. Three Aglianico wines wrapped up our Giornata tasting. We compared two from 2013 – from French Camp Vineyard and from Luna Matta Vineyard, and then tried a new release of the 2014 French Camp Aglianico. It was an interesting comparison of the 2013 wines – the French Camp is actually a bit lower alcohol than the Luna Matta but seemed riper and more forward due to its less tannic structure. The Luna Matta had more earthy and savory notes with a chewier tannic finish. Giornata makes several other wines in addition to the ones we tasted during this visit. The “il Campo Bianco” and “il Campo Rosso” blends are their wines made for everyday drinking. The current releases are blends of Vermentino, Friulano, and Pinot Grigio for the “Bianco” and a Sangiovese-based blend for the “Rosso”. They also make a “Ramato” – skin-fermented Pinot Grigio made in Italian amphorae – while their Sangiovese / Merlot / Petit Verdot “Gemellaia” is inspired by Super-Tuscan style blends. Dave asked whether we’d like to taste a wine made under his own Transmission label before we took off – sure! Dave has worked at both Giornata and Broadside since 2011 – he’s now the assistant winemaker for both labels – and he released his first Transmission wine not long ago. He poured us some of his 2014 Zinfandel, sourced from the same vineyard as Giornata’s Fiano and made in two neutral barrels. At 13.5% alcohol, it’s restrained for a Zin – especially one from Paso – and it was fresh and bright. Dave is working on a Grenache as well as a Zinfandel from 2015 and he’s aiming for a similar style for those wines. Between the distinctive black and white label art and the Transmission name, I had a hunch that Dave confirmed – it’s partly a nod to the band Joy Division (one of my favorites). Brian and Stephy have known from the start that they would be fighting an uphill battle with making Italian-variety wines in California. It’s no secret that some earlier and well-publicized attempts at “Cal-Ital” wines were not very successful, yet there have always been a handful of lesser-known vintners making good if unexceptional wines from these varietals. What Brian and Stephy have been doing is to help push California wines from Italian grape varieties – Nebbiolo in particular – toward a more “serious” and higher quality level. They’ve already shown that it can be done, and more vintners in the state have been taking similar paths in recent years. With California’s climate and soils, there’s every reason for many Italian varieties to flourish here. Of course it will take time to dial in both the viticulture and the winemaking, but I think that Giornata has maintained the right approach – picking on the early side, minimal intervention in the winery, and limited use of new oak. Despite a bit of resistance among some consumers, there’s unquestionably increasing interest in these wines. And in fact, Stephy told us that one of their proudest achievements is that they now export some of their Nebbiolo wine to Italy! My favorites among the Giornata wines we tasted were the Fiano, Nebbiolo, 2013 Luna Matta Aglianico, 2014 French Camp Aglianico, as well as Dave’s Transmission Zinfandel. Giornata is a small operation, so it’s necessary to make an appointment to visit, but it’s worth doing so and checking out some of the finest Italian-variety wines made in California. Eric, Al, and I headed back to town after our day of wine touring and got together than evening with a few friends for a Rhône-themed wine dinner to kick off the next two days of non-stop Hospice du Rhône craziness. I was able to unwind a bit on my drive back to the Bay Area after HdR, taking the slower but far more scenic route up Highway 1 and the Big Sur coast. Our Thursday wine tour had been a fun one – it was great to revisit Adelaida after so many years, and nice to check out the latest wines from Paix Sur Terre and Giornata, as well as to have the unexpected treat of trying the Transmission Zinfandel. All of the vintners we visited are helping to redefine Paso Robles wines. Although the region has been “discovered” in recent years thanks to wines from Saxum and others in a similar mold, the wines of Adelaida, Paix Sur Terre, and Giornata show that there are other varieties and styles of wine that can flourish in the area – it’s not just a region for big, bold red Rhônes and jammy Zinfandels. Pinot Noir in Paso? Ugni Blanc? Nebbiolo? Yes, yes, and yes! As always, thanks to everyone that we visited for being so generous with their time and their wine!